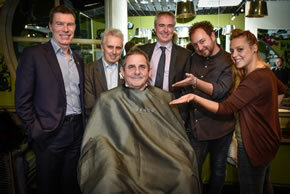 Hounslow Council’s leader, Cllr Steve Curran, has had his Movember moustache shaved off in Chiswick. 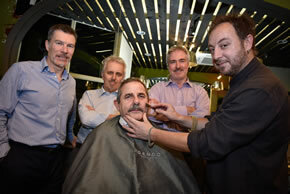 He was joined by Brendon Walsh, director of Regeneration , Economic Development and Environment and Alan Adams, director of Adults’ and Children’s Services as well of Head of Communications, Ian Tompkins, at Chiswick barbers, Genco, as part of the end of Movember. Cllr Curran and his band of brothers, grew their moustaches as part of the testicular cancer awareness campaign. Between them, they raised £500. Cllr Curran said: “I hated growing my moustache and was glad to see it go but was in a good cause and hopefully we have helped raise awareness of this important issue. Cllr Curran and colleagues afterwards. Genco – who have signed up to Small Business Saturday has been based in Devonshire Road for seven years – is owned by Bharat Parmar. Bharat said he chose Chiswick because the area was underserved by barbers. He said: “Generally there were lots of businesses aimed at women but there was nothing specific and bespoke for men. Bharat said he was looking towards Small Business Saturday. “Small Business Saturday is a welcome initiative that reminds people that there are interesting independent stores that provide a bespoke and customer centric service and a more personalised experience than the main branded chains.